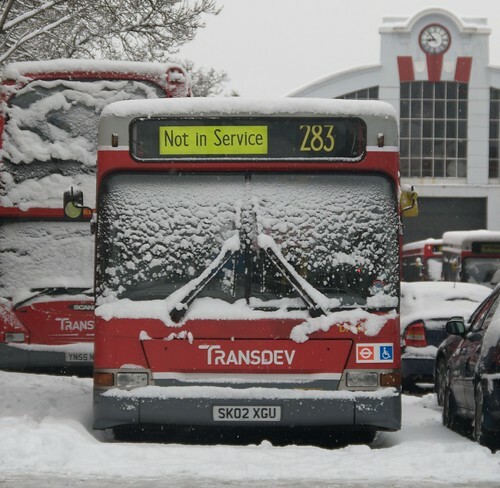 All operators have reported high levels of staff turnout, driver attendance was between 80 – 90 per cent depending on garage locations, there are reports of drivers walking long distances to get to work, some abandoning their cars en route. However, parts of the press consistently reported most of the lines were suspended, when, in fact, LU delivered service over approximately 80 per cent of the network, with the service delivered exceeding demand. The tube was in fact running a reasonable service but of unusual nature that the terming of this as part closure, delays or severe delays on most lines then meant that most media reported that the tube was mostly shut. Key also is that there was no defined hierarchy either in which transport modes, services or bus routes were considered most important to keep running with only a limited prioritisation of roads to grit. Most fundamentally the chain of command essentially snapped and the limited devolution London experiences failed to provide any strong leadership either from TFL or the mayor in large part because various agencies chose not to bother Boris or TFL and vice versa. The normal[1. and it pains me to put it this way, but I’ve seen it more often than snow in London] terrorist threat response of establishing a Gold command was not undertaken as the snowstorm was not seen as a major enough event. it was the first to run out of grit on the first morning of snow, which perhaps explains why they failed so comprehensively to grit the pavement in my street and the rest of the borough. As the report shows they even had to beg for grit from Ealing as well. 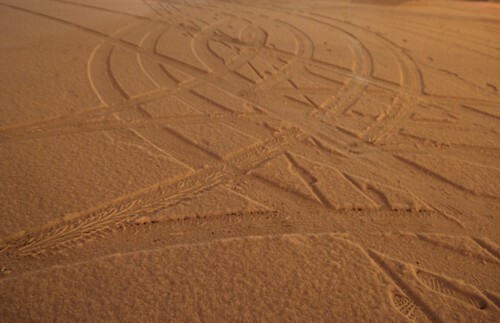 This also led them to leaving the sort of nice Lyric Square as an ice hazard. Perhaps they didn’t have time to write down the complete account of their inability to make the streets safe. I personally rather enjoyed the chaos of it all as I recounted in my earlier piece. Incidentally, I’ve been beaten in writing this post by The Londonist who’ve used the same photograph of mine. 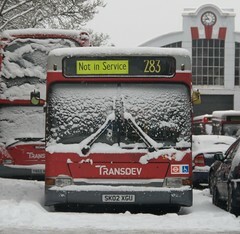 Hurrah for Creative Commons licensing, and nice snowy photos of London buses. This entry was posted in General and tagged bus, hammersmith, london, londonist, me, news, photo, roads, snow on March 2, 2009 by Alex. 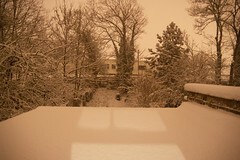 One week ago this was the view out of my bedroom window. I’d just dashed around Hammersmith for a good hour or more dashing around grabbing as many photos in the snow as I could, fearful that like all other snow I’d known in London it would be gone soon after dawn. And yet, I sensed it was different and excitement gripped me, and it felt like Christmas in ways that, frankly, even Christmas hasn’t for some years. Two very solid truths gripped me, first that it was going to be a good idea to charge my camera battery, and second that I was probably still going to be able to get to work but that it would involve getting the bus so I’d need to get up extra early so I could walk instead, and so I had to force myself to sleep. 7AM, my radio clicked on, and Edward Stourton’s voice seemed gripped by an icy sternness, it was wintery outside sure, but no, transport was monumentally screwed up in London. The Victoria line was running as normal, but that was it, almost every single railway line was blocked with deep snow and most amazingly of all the buses weren’t even running. This threw me somewhat, after all, if the buses weren’t running and trains were gone who on earth would be in the office when I finally got there? I pondered briefly before realising that if walking to work really was the only option then it would certainly be fun, different and damn good excuse to wear all of my hiking gear. I’d discovered the night before that only my proper walking boots offered decent grip in the snow, but now I grabbed my waterproof walking trousers and even my flask. I opted to leave the survival bag at home as I guessed that there would at least be coffee shops open. The walk to work was very very strange. Obviously I wouldn’t normally have been carrying my camera, but I also would have had my headphones on and been walking through traffic jams with buses thundering past in their lanes. But there was none of that. It was like walking through a small quiet country village early on a summer morning. Everyone smiled, except the drivers who grimaced with fear as their cars utterly failed to stop. The cyclists, and there were a fair few, seemed mostly to be enjoying it though they had next to no control of their direction. I did regret not bringing my bike for a bit, but realised that were I on my bike I’d have had no chance of getting so many photos. When I reached the core of Chiswick High Road, after a rather amusing closed shop sign, I finally found the first council workmen of the day trying to clear the avalanche. It was a task seemingly without end, but they all seemed remarkably happy and even smiled when I took their photo. At this point it was clear that I wasn’t really in London at all. 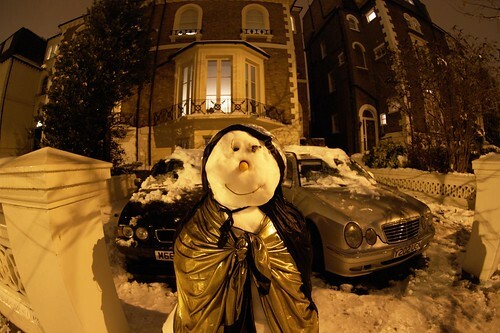 Londoners had all hid in bed, and opted to make snowmen. Real folk were out on the streets, pensioners, photographers and men with shovels and they all had a purpose and felt happy in it. And so I trudged on, enjoying with every step that strange sound walking on snow makes and feeling ever more glad that I’d opted not to listen to my iPod. Ultimately I reached the office, and on arriving I had a sudden fear, there I’d been merrily walking and snapping along and inside there’d be all my colleagues wondering what had taken me so long. It was not a fear that came to anything, however. Inside the office was but a small assortment of people, all with their own tales of how they’d made it to work, typically a fortunate drive down empty roads or a lucky tube journey. The longer we sat at work, the more concerned we got on the prospects of going home, though the reappearance of buses around 2:30PM whilst I had my lunch in the nearby greasy spoon did reassure me somewhat. The office cleared out as the afternoon progressed, and I opted to leave whilst I was sure I could walk home in the daylight, before the ice began. Wandering back, I traipsed through a changed city. I didn’t see the iconic sights, Westminster bedecked in snow, or Hyde Park covered in snowmen but instead I saw the streets I pass along every working day reconfigured for fun. 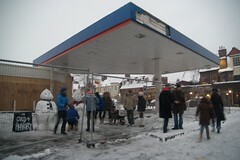 No sight gave me greater cheer than a group who’d commandeered a derelict petrol station and erected two of the most magnificent snowmen I’d ever seen along with a board saying simply “Cold + Hungry”. Signs that the capital was both working and in chaos (a normal state for London in all honesty) came when I saw the inevitable Evening Standard headline of London Snow Chaos. Of course there was no such thing, though in a remarkable move the local council had opted not to grit the local park because of the inclement weather conditions. The closer I got to Hammersmith the more everything felt like normal again, and I was much relieved having hurriedly bought food in the supermarket (before it shut early at 6) to discover a set of charming and different snowmen in my street. After a few hours spent defrosting and posting photos onto flickr I realised that it would be a good idea to nip back out with the camera but with the fisheye lens and see what snaps I could get of the snowmen. I also dashed into the car park at the bottom of the road and wrote SNOW in large friendly letters, to quickly compensate for my lack of snow creation. Some were probably compromised by my choice of lens but I think a few are pretty good, like this one. In comparison the following day and the rest of the week was dull. Sure, there was ice everywhere and I took my Thermos with me again on the second day just in case the worst were to happen, but it felt like it had all gone back to normal very quickly. 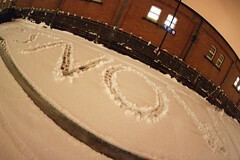 My inner survival instinct felt cheated, I however, was utterly cheered that evening to find on returning to the car park that night that my SNOW lettering had been left completely untouched. I pondered briefly if there was an easy way to salt it such that would melt and reform to say ICE and wandered on my way. Meanwhile a car driver was having the time of his life doing doughnuts driving in circles around a lamp post. I guess we all have our pleasures. 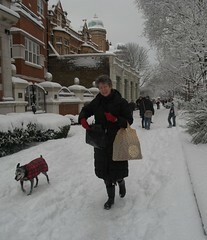 This entry was posted in General and tagged Christmas, london, me, photo, snow on February 8, 2009 by Alex. I’m not necessarily going to make it to work but I’m going to try just to get photos en route. Last time I saw this much snow it was on Schiehallion just before the end of the year. 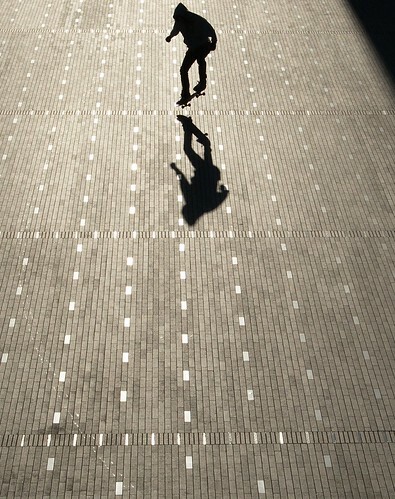 This entry was posted in General and tagged london, photo, skateboard, snow, walking, west london on February 2, 2009 by Alex.